When I started homeschooling six years ago, I decided then and there that I was not going to follow the traditional schooling model. My boys had been in a Montessori school prior to us homeschooling, so they were never forced to sit at a desk and keep quiet. We have taken a different path. One that is more family friendly. Unconventional. A real commitment to try to make learning fun! 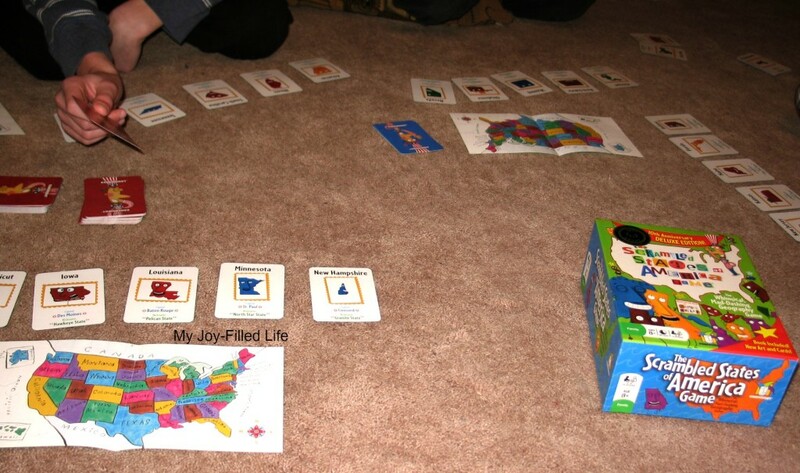 So, I wanted to share some of the games we use in our homeschool. My children are older, 15, 13 an 11 and they are pretty independent learners. With older students, the tools we use and even our work areas look different than they did when they were younger. As you see, we love games! I didn’t even include in this picture all the strategy, critical thinking games like Chess, Blokus and Exago. Or the just-for-fun games that my boys play constantly. I just included the ones we regularly use with our curriculum. There are so many games to choose from to write about, I decided I would narrow this article to games that we love to play regularly. I hope these games will inspire you to find games that will add some excitement into your homeschool routine!! All three of my boys are taking Algebra right now. 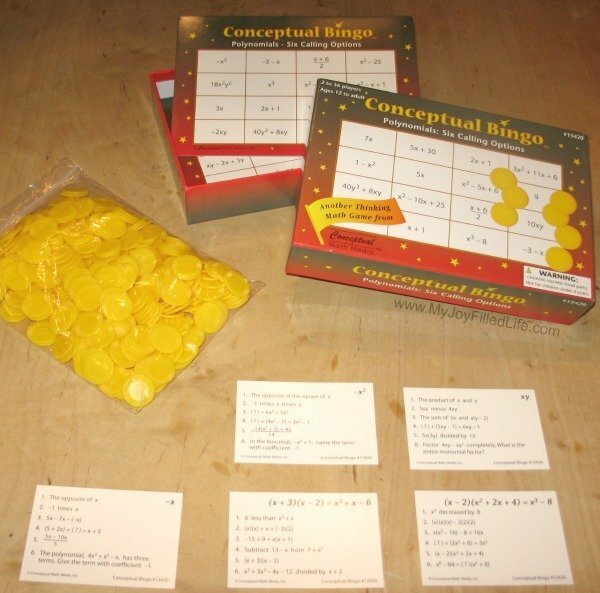 One of our favorite resources to review and study Algebra is Conceptual Bingo. They have all kinds of math games and even have several different algebra games that we use to work toward mastery of algebraic concepts. 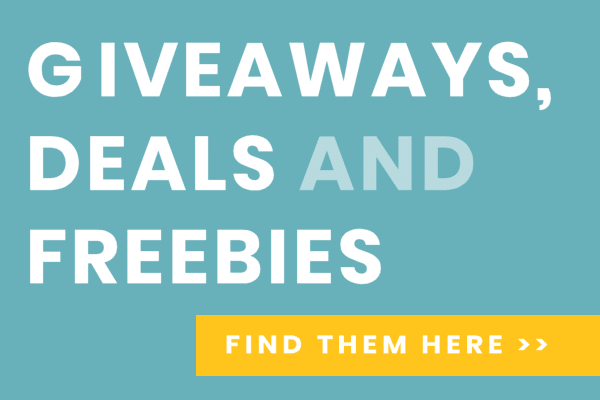 All of these Bingo games offer six different “calling options” (problems to solve), which makes them easy to customize to each of my children’s skill level. When I play with my boys, Chase, my oldest son is getting the hardest most advanced problems while my youngest son, Blake, is getting closer toward the easy end. 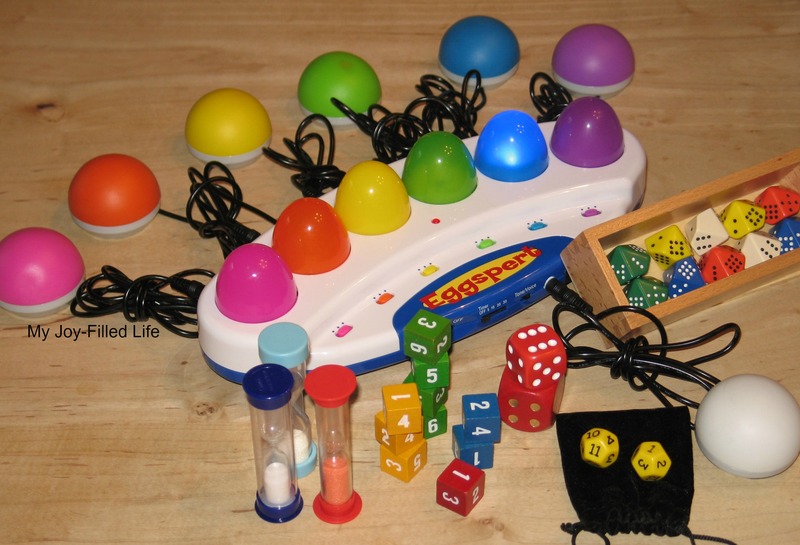 We love playing these and will play for hours on end. Even my child that is a bit easily distracted stays fully engaged playing these. 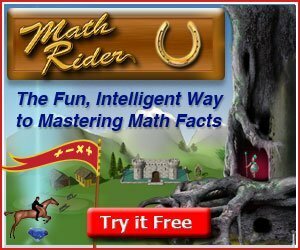 Another Favorite Math Game is Equate. It is very similar to Scrabble but with numbers instead of words. This game is also adaptable to younger students with the Jr Tiles version and Advanced Tiles for your older children. It took us a little while to develop a liking for this game, and it is still a challenge to use Algebraic formulas instead of taking the easy route (see game board above for proof), but now we love playing it! One of the most dynamic materials I have found for geometry review is Geometric Stick Material. It is a Montessori material that we love. It can be used to study lines, the measurement of angles, and the construction and analysis of plane geometric shapes. We use a cork board specifically designed for the stick material, but I imagine you could use any thick cork for this purpose. We printed out these free command cards from Free Montessori to make this more random and challenging. I am always looking for ways to save money so here is a free geometric stick material printable from JMJ Publishing that you can cut and laminate to use! You can use a cork board you already have or purchase a thicker piece like this one. Language Arts games are harder to find, in my opinion, than Math games. So, I thought I would share some of the ones we regularly use and truly love. 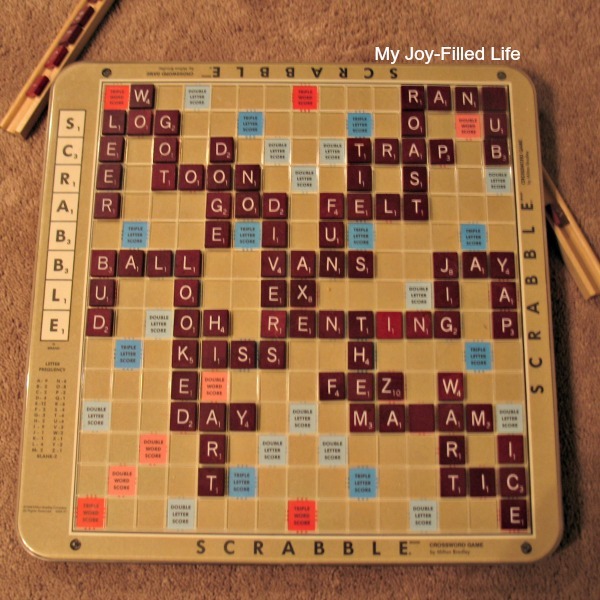 Scrabble is one that we play all the time just for fun (yes, I would call that a huge homeschool win). With three boys, somebody is always kicking the game board, so we prefer the game board that is grooved so it will hold the game pieces in place (Equate should consider doing this too). 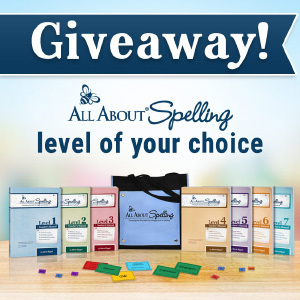 You could customize the Scrabble game for extra challenge to focus on a topic (like history or zoology) or a spelling list and offer extra points if they can use their spelling words in the game. 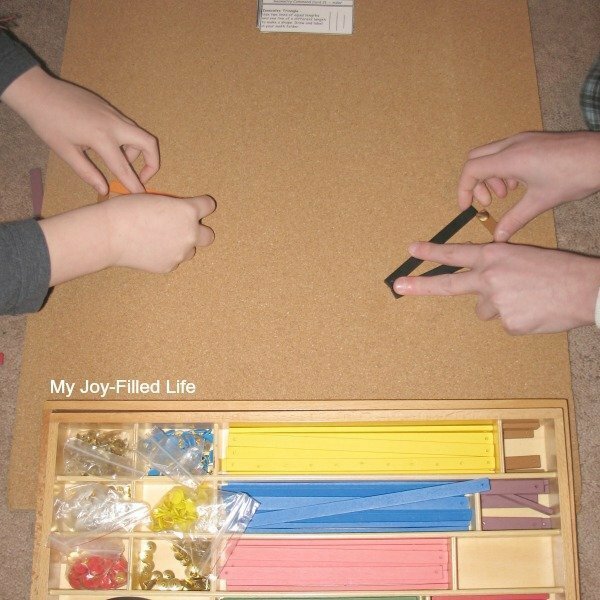 This is one game that every homeschool should have and use! 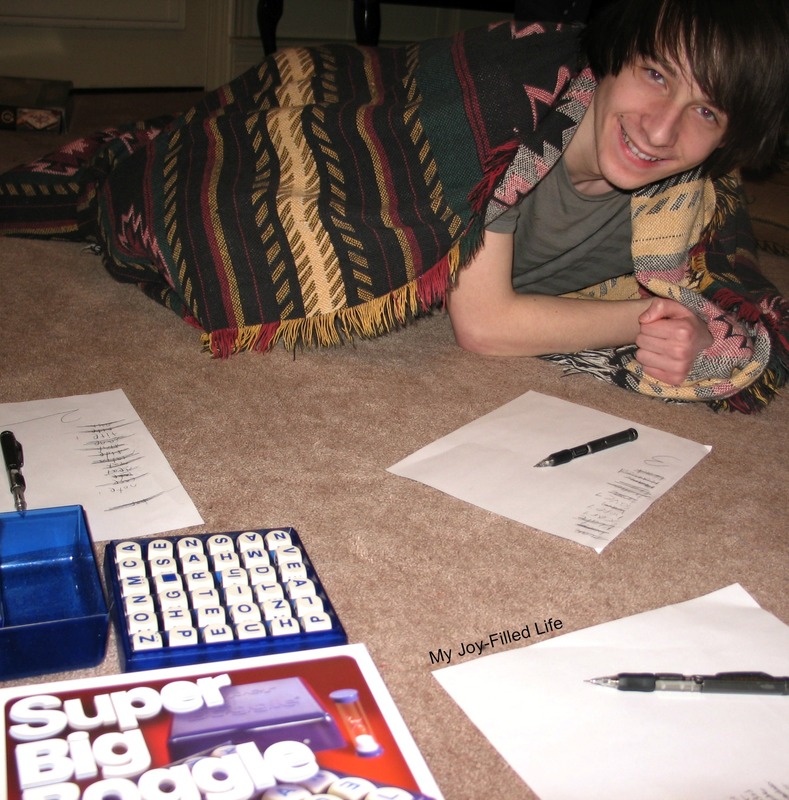 A new game we have recently added to the line up is Super Big Boggle. I use it as much for a critical thinking game as I do for a language arts game. Although, I will say it is fun to see some of the words we come up with and their misspellings. We regularly pull out the dictionary to be sure the words are not actually words. It’s a great way to add to our vocabulary 🙂 I have always taken words apart and made smaller words out of them… as a mind game. So you know I love playing this game with them! Am I an awful mom to not let them win? They are 15, 13 and 11… so they need to taste victory and defeat, right? LOL! Geography is another subject that I don’t usually see a lot of games for. We have a ton of them! I don’t even know how you study Geography without the hands-on element! 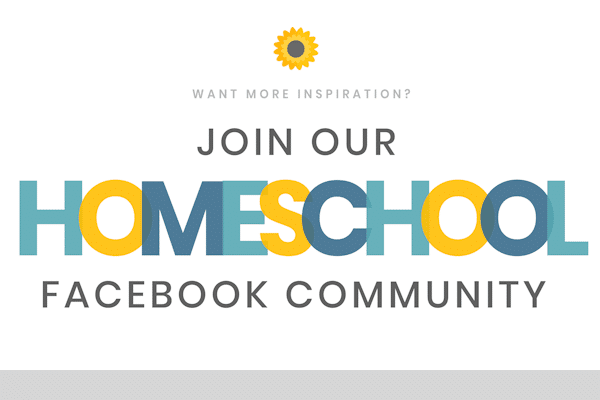 So, I’m going share what we use and maybe they will work well for your homeschool too. Are you surprised to see a Cook Book in this section? We love to dive into the culture and literally taste it! 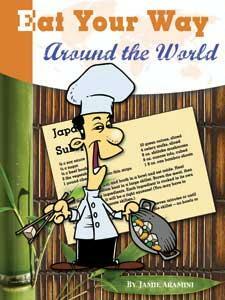 Eat Your Way Around the World is one that we have used for a long time! My youngest son, Blake, especially. Our favorite so far has been the Egyptian meal. We were introduced to this cook book and Eat Your Way Around the US through studying Paths of Exploration. Another item we have borrowed from our Montessori-ish homeschooling experience is Puzzles from around the world. These are not your typical cardboard puzzles, but wonderful and vibrant wood puzzles that are not labeled. We have labels and control sheets (answers) for each map. They work the puzzle and then label it on their own. They check their work when they are complete. If you would like to see if your children would enjoy this activity, here is a free world map from Parents.com that you can print. Scrambled States is a fast and fun game. We are a family of five and this is only a game for four, but we figured out a way for us all to play. We take turns being the card reader and judge of who was first. We love that this game has some other elements thrown in. 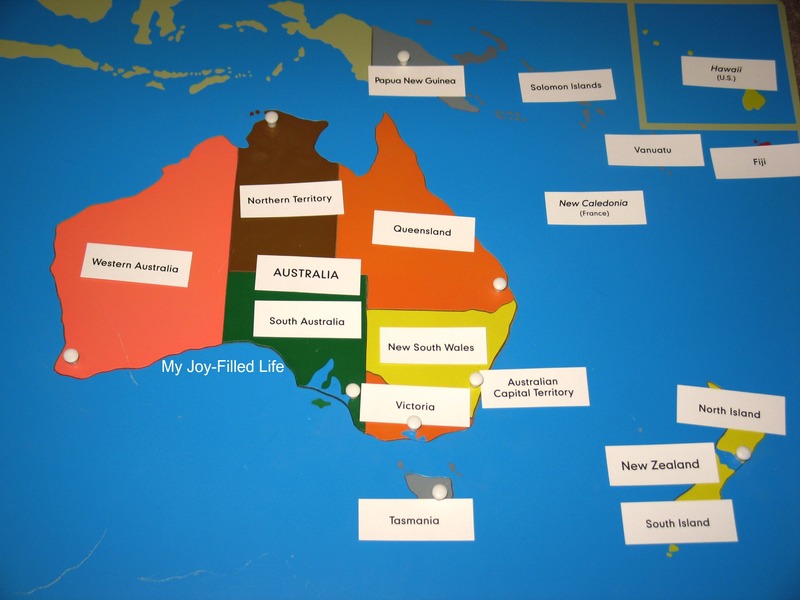 You’ll find some language arts challenges (vowels at the beginning and end of the state name) along with the geography. And the geography is more than just the location of the state, it includes capitals, nicknames, shapes and positions of the states played through a myriad of visual teasers, language riddles and geography challenges. It. Is. Fun. Eggspert by Educational Insights is brilliant! 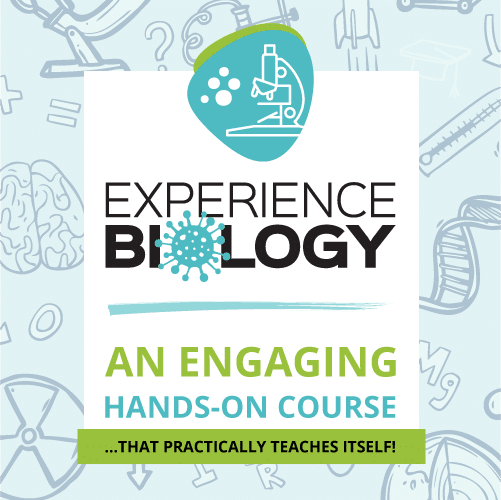 It adds a game show element to your homeschool reviews. With three boys, it is easy to get some fun competition happening! We have reviewed every subject using this tool. You can have it pick a random child or have them buzz if they know the answer. This is a huge win for helping to make learning fun! Timers can make any task a challenge and fun, but it also serves a better purpose. Adding a timed element can also help your kiddos stay focused. For instance, telling them that this activity will be a certain amount of time and setting the timer allows them to focus on the task at hand knowing the timer will sound when it’s time to finish. It worked really well for my easily distracted child. Dice, especially for math review. We love to take polyhedral dice and roll two and either add them, multiply them subtract them, etc. to help with math fact review. We used it most with our multiplication facts and we competed with each other! 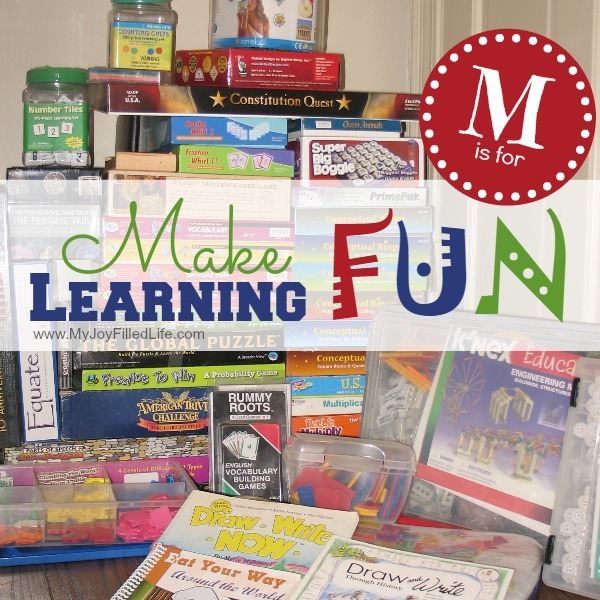 I hope these games are ones that your children will fall in love with and will add some fun and excitement to your homeschool routine! 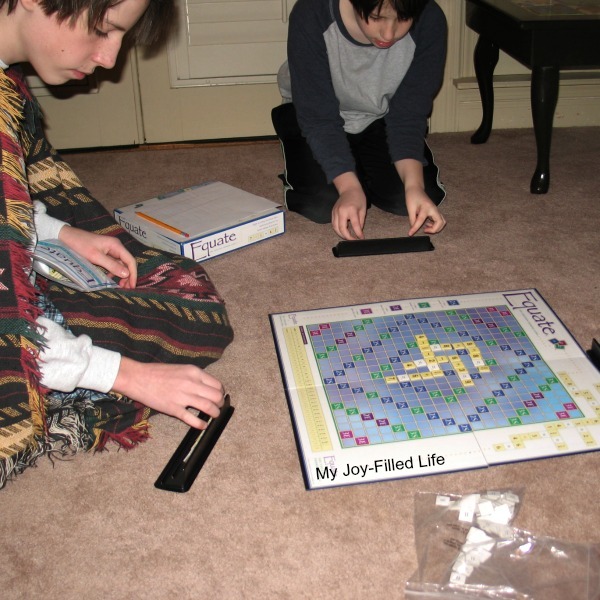 What games do you use in your homeschool that have become favorites? Trish Corlew is a co-owner of Hip Homeschool Moms and owner/writer at Live and Learn Farm. Trish has been married to her best friend, David, for 17 years and they have three sons (aged 15, 13 and 11). Trish is from the coast of North Carolina, but they now live in rural West Tennessee on a 40+ acre farm. She has been homeschooling since 2009 and her homeschool style leans towards a Montessori approach with a heavy emphasis on hands-on learning. Trish’s family is Messianic and they love studying the Scriptures, learning Hebrew and growing in their faith and walk daily. In her spare time, Trish loves to write, work in their garden and can regularly be found trying to learn something new, modeling that learning is indeed a life-long endeavor! 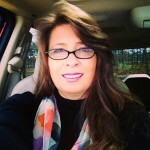 Follow Trish on Facebook, Twitter, Pinterest, Google+, and Instagram.